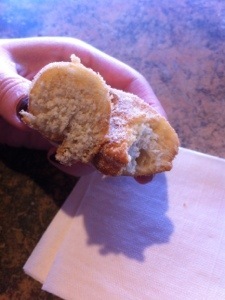 Have you ever had food so good that you quietly and slowly eat and savor each and every bite, happily enjoying your moment of food bliss, yet anticipating a little bit of sadness because you know that the moment will end when you finish eating? Have you ever had food so good that it rendered you speechless? 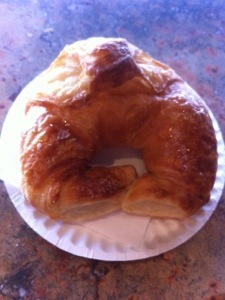 I have, and I did this past Sunday at Isabelle et Vincent’s French Bakery in Fairfield. I must start by explaining that when I have a good food experience I usually react in a few different ways depending on how good the food is to me. 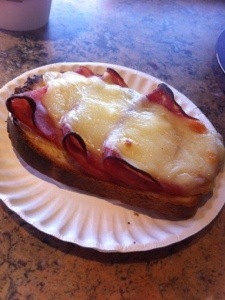 Good food gets me talking incessantly about the food and the food spot to everyone I know (hence, this blog was born). Very good food, aside from talking about it, also prompts me to high-five the person I’m sharing a meal with, or sometimes I clap my hands (quietly, of course) so I’m essentially applauding my meal, or I kind of do a little dance in my seat, or I make those omnom type noises (you all know what I’m talking about, and I know some of you do the same things). Excellent food? 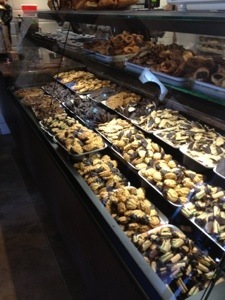 Excellent food renders me speechless. Excellent food gets me to say things to my husband such as, “I can’t talk to you right now because I’m eating this ______, I need a minute.” I said these words three times on this past Sunday morning – THREE. My husband cracked up and had fun tweeting what I was saying and compared it to a When Harry Met Sally moment. 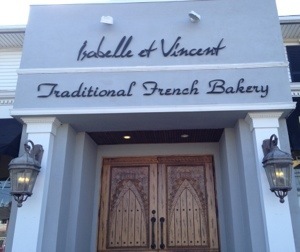 I, on the other hand, was speechless and experienced that food bliss moment many times during our visit to Isabelle et Vincent’s Bakery. Did we try everything we wanted to? 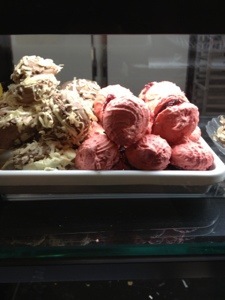 No, but we are already talking about what to order on our next visit. Did we eat too much? Probably. Was it worth it? Every. Single. Bite. 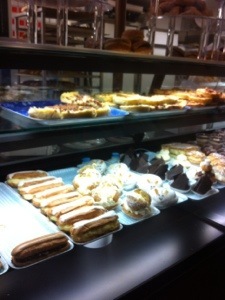 The selection at the bakery sounds diverse from their website, but I was not prepared for just how extensive the menu is. 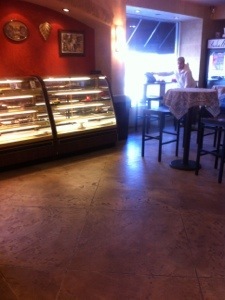 When we first walked into the bakery I was impressed with the large wooden front doors, the display of awards and press the bakery has received, the cozy seating areas just as the website describes, and the smells of fresh baked goods. 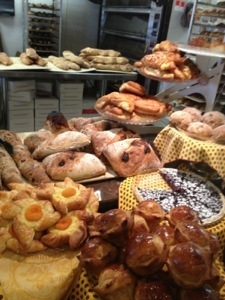 Follow your nose up a small staircase and you enter the main area of the bakery, and the displays of baked goods spread before your eyes. 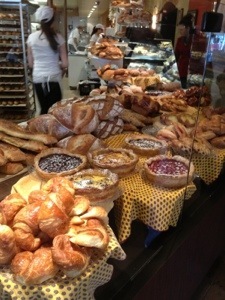 We were a little taken aback, we had only planned on trying a croissant or two. After a quick game plan, we decided to try a whole bunch of items off the menu and split them all. 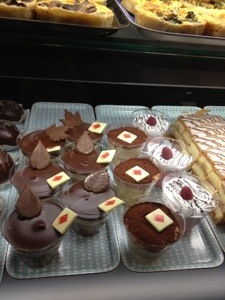 I must add that the staff was friendly, knowledgable about all the items in the bakery, and even more importantly, they were very patient as we tried to figure out where to begin and what to order. 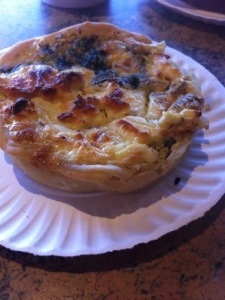 We started off with three quiches: bacon, ham and cheese, and a spinach and goat cheese. The quiche are just the right size for an individual serving or big enough if you plan to share (and order more than one item from the bakery- hint, hint). 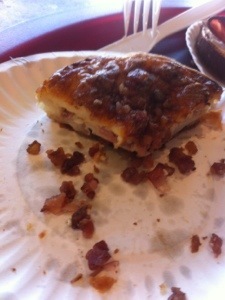 The bacon quiche is light and airy, and not heavy at all as you might expect from a bacon and cheese quiche. 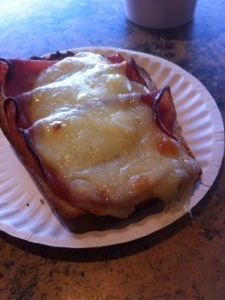 The ham and cheese quiche I would consider to be more of a cross between a crostini and a quiche: toast layered with ham and cheese. 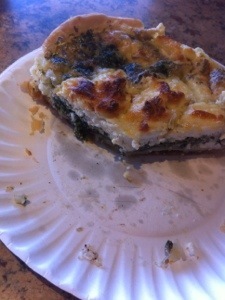 The Spinach and Goat Cheese Quiche was a bit of a surprise, the kind of surprise you like to receive. I assumed this quiche was made with swiss and in my excitement while ordering I forgot to ask. The goat cheese in this quiche adds a subtle tanginess and paired with the spinach and light pastry crust it creates a well-balanced quiche that I had trouble sharing. 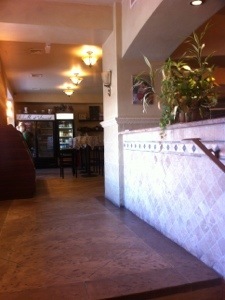 TIP: If you dine at the bakery they will heat up the food for you. 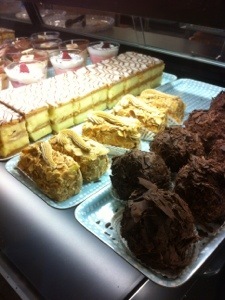 We initially planned to take these to go, but when you find something good why stop when you’re just getting started? 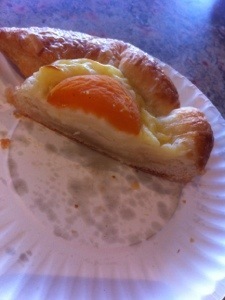 It looks like a turnover and it was very similar to one, however, Isabelle et Vincent’s calls this their Cherry Croissant. 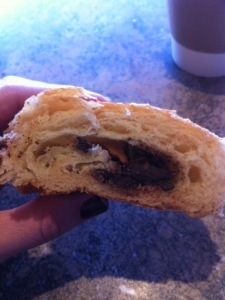 This pastry made me declare that I had died and gone to pastry heaven. This light and airy, buttery pastry flaked just right when you bit into it, and then it melted in your mouth in a way only excellent flaky pastry dough can. The sugar sprinkled on top creates the smallest bit of a sugary crunch and gives the croissant just a little extra sweetness which is not overpowering. 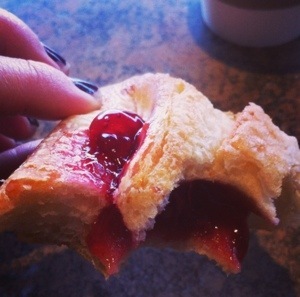 The cherry filling is subtle, in fact I’m not a big fan of cherries, but in this pastry I would eat them each day if I could. 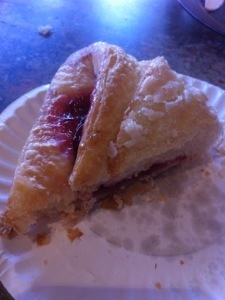 It is perfection, it is pastry heaven, it made me incapable of speaking while I was eating it, except to say that I could not speak while eating it. 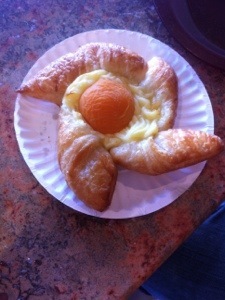 I had never heard of a bretzel flan before. My husband picked this one out and I am grateful he did. The pinwheel shaped pastry is made of the same light flaky buttery dough as the croissants, but in the center, that’s where the magic happens. 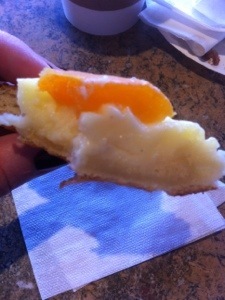 Picture a custard type filling, the bakery calls it a flan center, topped with a tangerine preserve. 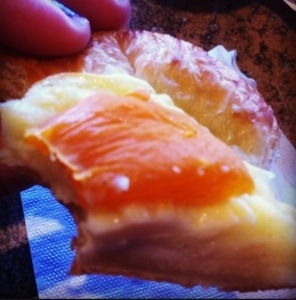 This pastry is essentially a great combination of a butter croissant with a creamy flan- like custard center, almost with the consistency you might find in a cheese danish, and the citrus flavor of the tangerine that is subtle and refreshing. 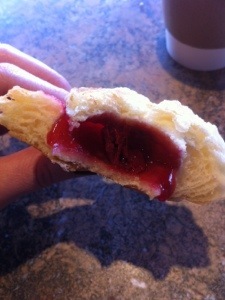 This one you must try, this pastry will change your life. 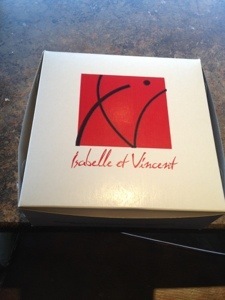 My food quest for pain au chocolat in CT which resembled those our friends brough back from Paris a few months ago is what initially brought me to Isabelle et Vincent’s. 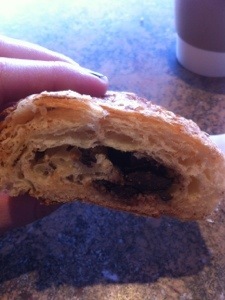 And yes, these are the closest I have come to finding pain au chocolat like those Paris pastries. Light, flaky, buttery, and filled with decadent chocolate right in the center. 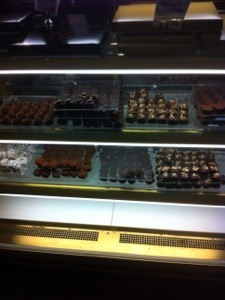 You must try them! 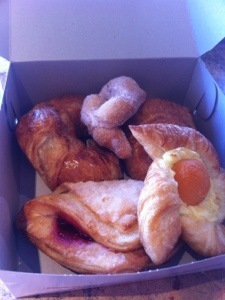 TIP: The bakery also makes miniature size pain au chocolat and butter croissants for special orders. 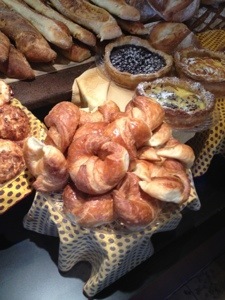 Butter croissants are a personal favorite and what I consider an ideal breakfast food – who doesn’t like bread and butter? 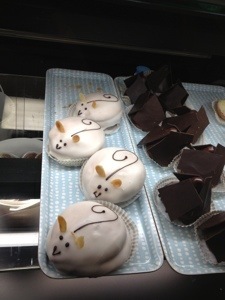 I like to order them at many different bakeries for breakfast; I even will order one with my latte at Starbucks occasionally. 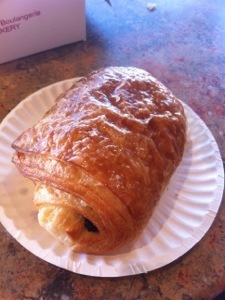 But after my visit on Sunday, I will now only eat croissants from Isabelle et Vincent’s. 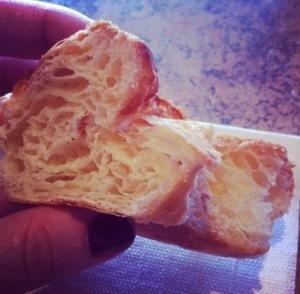 This is how butter croissants are supposed to taste. Soft to the touch, they spring back if you lightly smush them with your fingers, yet they are also a little flaky on the outside. 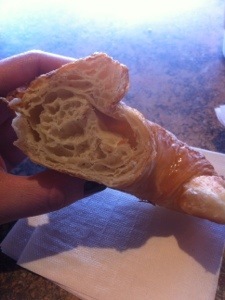 The center of the butter croissant is made of layers of buttery goodness, but the pastry is not heavy at all. 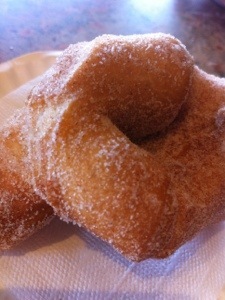 The beignets at the bakery come in several flavors but we chose to try the plain beignet. 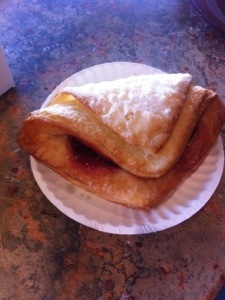 Very similar to a plain cake donut, the beginets are a heavier pastry than the croissants and go well with a cup of coffee. 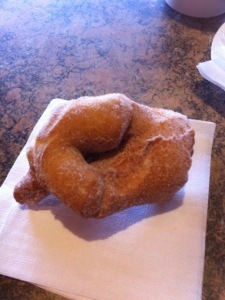 I suspect this beignet is a hit with the kids, and I know my nieces and nephews would like them. 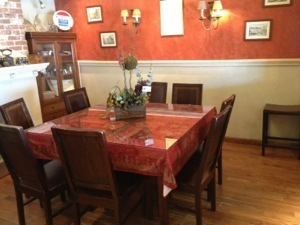 An added feature of our visit? 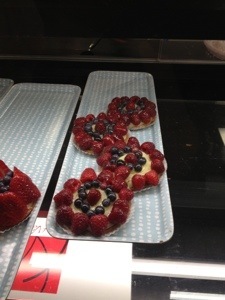 Vincent himself was in the bakery baking and we were able to say hello and ask a question or two about the pastries, which he happily answered and even made further recommendations. 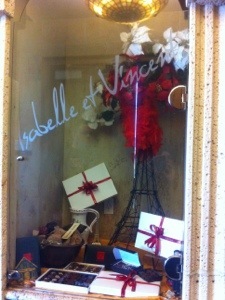 Visit Isabelle et Vincent’s French Bakery c’est magnifique!